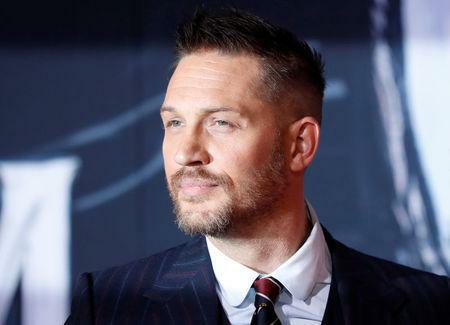 LOS ANGELES (Variety.com) - Tom Hardy's "Venom" grabbed $35.7 million to repeat as the winner of the North American box office, followed by Lady Gaga's "A Star Is Born" with $28 million. Ryan Gosling's "First Man" launched in third place at the low end of expectations with $16.6 million at 3,640 sites, edging the opening of Sony's "Goosebumps 2: Haunted Halloween" with $16.2 million at 3,521 venues. "Venom," which declined 56 percent, is the first repeat winner at the box office since "Crazy Rich Asians" won three straight weekends in August. Moviegoers have continued to shrug off negative reviews as the movie has taken in more than $142 million domestically at 4,250 locations in its first 10 days for Sony. It's also continued the dominance of Marvel's characters in the superhero movie realm. "A Star Is Born," bolstered by stellar reviews and fans excited over the Lady Gaga-Bradley Cooper collaboration, declined by only 33 percent and lifted its 10-day total to more than $94 million at 3,708 venues. "First Man" audiences gave the film a B+ CinemaScore. Universal's distribution president Jim Orr said that the "First Man" results were not disappointing, given that the core audience is an older demographic. "As we've seen in this release corridor, quality films like 'First Man' -- Certified Fresh at 88 percent on Rotten Tomatoes -- have strong playability and will have tremendous legs at the box office," he said. "This weekend's results are a just a starting point. Quality adult dramas released in this time period produce very healthy multiples. This is very much a marathon, not a sprint." "First Man," directed by Damien Chazelle, follows Neil Armstrong's life and the years leading up to the Apollo 11 mission to the moon in 1969. "First Man," which premiered at the Venice Film Festival, is receiving a major campaign for awards. Chazelle won the Best Director Academy Award last year for "La La Land." "Goosebumps 2: Haunted Halloween" debuted slightly above expectations as it aims at family audiences. The original opened with $23.6 million in 2015 on its way to an $80 million domestic total. Warner Bros.' third weekend of animated comedy "Smallfoot" took the fifth spot with $9.3 million at 3,606 locations for a 17-day total of $57.6 million. Universal's third weekend of "Night School" followed in sixth with $8 million at 2,870 sites giving the Kevin Hart-Tiffany Haddish comedy nearly $60 million. Fox's "Bad Times at the El Royale" opened below estimates in seventh place with $7.2 million at 2,808 screens. The mystery, which had been pegged for a range between $8 million and $12 million prior to the weekend, stars Dakota Johnson, Chris Hemsworth, Cynthia Erivo, Jeff Bridges, Jon Hamm and Nick Offerman. Critics are supporting "Bad Times," set at a fictional hotel on the California-Nevada border, with a 75 percent "fresh" rating on Rotten Tomatoes. Universal's fourth weekend of "The House With a Clock in its Walls" followed in eighth place with $4 million at 2,791 locations for a 24-day total of $62 million. Fox's expansion of teen drama "The Hate U Give" finished ninth with $1.8 million at 248 sites.